Many of us primarily experience ourselves through our mind, physical body, and spirit: those being the most obvious parts of our whole being. However, a human is made up of much more. We are rich, multifaceted beings comprised of many energetic building blocks. We each come with our own personal code that can help us unlock the mysteries deep within and transform them in to mastery. 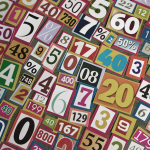 Through understanding our relationship with numbers, we can crack that code and use it to heal and balance ourselves. Yogic Numerology is interpreted using the numbers 1 – 11. The numbers 1-10 correspond to one of our 10 bodies; 11 is the 11th embodiment or the place of mastery. The numbers 1 – 7 also correspond with our chakra system. At first we may relate primarily with our physical body, mind, and spirit. However, there are many other aspects of ourselves waiting to share vital energetic information with us about how to be happy, healthy, and whole. I like to relate the 10 bodies and 7 chakras to the strings of a musical instrument. Instruments can easily fall out of tune, even when sitting in a room without being touched. The effects of temperature change and relative humidity can cause the strings to expand or contract, slightly changing their pitch. In order to get the strings vibrating at the proper frequency, they need to be tightened or released by the musician. By developing a relationship with yourself through the 10 bodies and 7 chakras you can start to notice where and when you need to tune yourself. Next, you can combine this knowledge with your own personal numerology code to learn your strengths and weaknesses and why you may need tuning more often in one area than the other. Your personal numerology code consists of 5 different numbers that reside in their own unique position. The numbers 1 – 11 can be in any one of these spots. In this practice, we do not condense down the numbers 10 or 11 by adding them together. 11 will stay as an 11 and 10 becomes 1+. However, any numbers higher than 11 are added together to give you a single digit to work with. For instance 12 would be 3 (1 + 2 = 3). 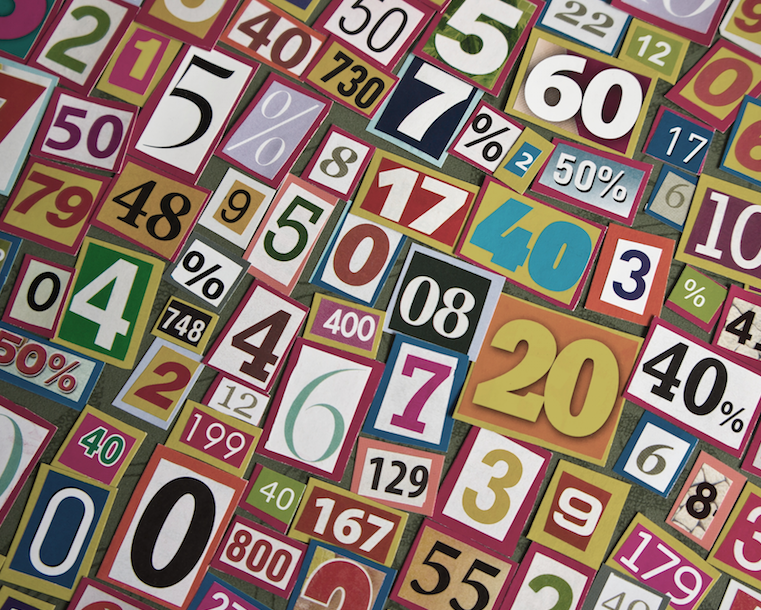 Each number can manifest a positive and negative quality. Which qualities show up at what time depends on how well you are taking care of yourself and cleansing, balancing, and working on mastering your 10 bodies and 7 chakras. The good news is that yoga, meditation, and pranayama (breath work) give you the means to keep yourself in balance and push through any negative reflections that come up. This number reveals how you relate to the external world and to relationships with others. It is one of your challenge numbers and you may experience its negative aspects often. Through connecting with this number and understanding its attributes and those of the body it is associated with, you have the opportunity to transform your Karma into Dharma, creating harmony between your internal and external worlds. This number reveals how you relate to yourself and to the God consciousness within you. It connects you to your soul, which is the deep spiritual and creative part of yourself. Like your Karma Number, this position will reveal a weakness. When are you are able to consciously connect to your soul self, you will no longer feel any feelings of separation or alienation and will always feel at peace within yourself and your environment. This number reveals a positive quality you have been given in this lifetime. It will support you in moving through the challenges presented by your Soul and Karma Numbers. The body and chakra associated with this number indicate natural talents that you can rely on to support you when under stress and pressure. It’s important to strengthen and use your gifts as much as possible. The use it or lose it rule can apply here as the negative side of this number can overpower the positive when one is denying the gifts they are given and not using them. This number reveals what positive qualities you have been developing through many lifetimes and what talents you have access to in this lifetime. Connecting to your deep personal history and well-developed skills works to support you through the challenges and weak areas in your chart. When we are not using the talents we have mastered in many lifetimes, they can show up as the negative attributes of the body and chakra associated with the number in this position. Through developing a relationship with this number, you are able to connect to your inner mastery and use it platform for balance and personal strength. This number represents what talents you need to master in this life in order to feel complete and fulfilled. It shows you what avenues to take so you can serve and teach others how to do the same. When you have mastered the body and chakra associated with this number position, you are doing what you are supposed to be doing and loving it. You are inspiring others to be on the right path and feeling supported by the universe because you are fulfilling your own personal mission. Through understanding this number, you connect with own personal divinity. Once you have calculated your numbers and familiarized yourself with them, you can then meditate on how they relate to your current experience. You will start to notice where to make adjustments in yourself and your environment to experience more harmony and flow. Find a yoga set and meditation that will help you balance your 10 bodies and 7 chakras as well as strengthen the ones in your natal chart. If you are unsure where to get started, find a local teacher or practitioner in your area who can help you. To dive deeper in to Yogic Numerology as taught by Yogi Bhajan you can read Numerology As Taught by Yogi Bhajan and Tantric Numerology, both by Guruchander Singh Khalsa, The Ten Light Bodies of Consciousness by Nirvair Singh Khalsa and The Kundalini Yoga Experience by Guru Dharam S. Khalsa and Daryl O’ Keefe. I am available for questions and personal readings, and suggestions for sets and meditations to help. Just leave a comment! It was really interesting reading this blog. I could never think of understanding numerology in a simpler way. This blog helped me to understand, Thanks for sharing the informational blog. when they are functioning properly. No all cultures visualize the chakra symbols the same. My birth day, or re-appearance day as the Haris call it, is the 12th of January, 1970. I have read a little about tantric numerology and did not realise the 10 bodies have a direct bearing on the chakras. You will have noticed my gift is 7, which is the crown chakra. I knew that my gift related to my aura but would have never thought of my gift as my crown chakra. Indeed is it? Is it the same as saying my crown is my gift? That if I did lots of kriyas/meditations for the crown chakra it would help develop my gift as well as my aura? I am a little confused because I always thought of it as just my aura and it appears that unlike the other 6 bodies relating to the chakras, the number 7 is both the aura which is the 8th chakra as well as the crown which is the 7th chakra. When I think of the crown chakra I think of boundlessness and when I think of the aura I think of boundaries. They are polarities in a spectrum in that sense, one exists in space and the other beyond space and indeed who i am is beyond space even though my physical body is not. If my gift is both the crown and the aura is this to say that by developing my crown I’ll experience a double whammy benefit in which my 8th chakra is also benefitted? I am intrigued and would love to hear what you have to say on this and also because in terms of numerology it is also a generational thing directly relating to anyone else born in the 1970’s. My other question relates to when the soul number and path are the same, one of the other ladies who wrote in also had this in addition to the destiny number being the same. When I realised I had this I just figured that my path was my soul which is very general and not altogether helpful in that you could say everyone’s path is their soul. What does it mean when just the soul number and path number are the same? this is gripping stuff for me. Hi, I’m interested in your thoughts on a person changing their name or even just the spelling of it, for the purpose of creating a more positive, successful life. Is this wrong to do? led to neurology and in your site resonated most with my inner being. Honestly, I’ve recently been told my numbers and am scared and hesitant to stand in my light. DOB January, 12, 1978. I’ve been told I am a master manifester and that my path is one of leadership and spirituality. Why am I having such a hard time accepting this, feeling like I’m not good enough or have enough to offer. What suggestions might you have for my meditation practice that has been lost? I read the article, very interesting! Could you tell me, please, how can I bring love in my life? What do I have to do in order to improve my relationships and to be more in harmony with myself and others? What is the meaning of my life, how can I fulfil it? Hi from Argentina!! I’m interested in numerology but I wonder if I could get your books here in Buenos Aires, the capital. Is that right? For path I didn’t separate the number 11 was I suppose to? I’m going to look into the books but just wanted to see what you had to say too. Thank you! I have just read your wonderful article regarding numerology. I calculated my numbers according to my birthdate (7/6/1976). And my numbers are as follows: Karma 7. Soul 6 Gift 4 Destiny 5 Path 9. I imagine that you are at solstice right now! I am waiting for the book on the Ten Bodies. I am interested in what Yoga Sets or meditations it would be wise for me to focus on to ensure that I maintain balance~particularly of the Negative Mind as it is such an aspect of my being…. Also, my husband’s DOB is 09-01-64. We have been together since 1988 and married since 1991 and have two children. I started Kundalini in February 2010. This may beyond the scope of a request to post, but I won’t know if I don’t ask, right? We are having issues right now. It seems to me that he is so much in his head and desirous of being right~as opposed to being a partner. He seems to want to be in control and is very judgemental. Is there anything I can work on to Communicate better with him~I have invited him to do yoga several times~he is derisive about it and somewhat resentful for how much happiness and balance it has brought me. Thank you for any suggestions and wisdom you might share! I would appreciate some guidance on my numerology numbers. Thank you very much for helping with numerology. My date of birth is 10th March 1957 (03/10/1957). I calculated my numbers as soul = 10, karma =3, gift =3, destiny = 4, path = 8. Please help me understand the numbers and what kriyas and actions I should take. I have just recovered from very serious illness and am currently unemployed. Thank you so much for replying to my post … it’s scary how accurate the numbers are! I will definately follow your suggestions and work on balancing the 3 and work on the 3rd Chakra. 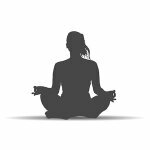 I’m new to Yoga … Would Kundalini Yoga be the best? There’s a link at the bottom on this article to a url where you can apply for your spiritual name! Blessings, Carol! Wow. What an amazing breath work/meditation! 16 minutes of Sat Nam Wahayguru, and my whole body is buzzing. It kick-started reiki healing. By the end of it, I felt very centred. Thank you so much for your kindness – I can’t tell you how much I appreciate it! I’m still a newcomer to Kundalini Yoga, though you’re absolutely dead on: I love the breathwork and mantras. In fact, I was just going through the mantra instructions album I bought last night, and was listening to Sat Nam Wah Hay Guru when I thought I’d have another look at this article. Apparently, there really is no such thing as coincidence..! Also, I truly committed to daily meditation this week, and all sorts of resources have come my way (I even signed up for the Global Sadhana). Your advice is now in a document for me to print out and use this evening! I’m so sorry to hear about your husband. I’m sending you prayers for healing blessings, light and love. You have a the ability to use and master the power of your positive mind to help you overcome your challenges. The 11 in the Gift position is Mastery and the 3 in the Destiny position means you have had the attribute of a strong positive mind with you for a long time. I suggest doing any yoga set that will help you strengthen your navel point (3rd Chakra). Because you also have the 3 in your Karma position and often experience the challenges of this number, your negative mind may take over often and overshadow all of the wonderful things that come along with being positive, thinking positive, serving others and seeing yourself equal to others no matter what. When dealing with unexpected tragedy, the negative mind may be in overdrive so I highly recommend balancing that 3 and using your give of mastery to conquer it and use it to help you get through these challenging times and heal. I am so sorry about your challenging times. I am saying prayers for you and sending you man blessings. Please know that these times of challenge work for us so we can learn and grow. You are subtle, calm and graceful and you will get through the current difficulties you are experiencing. You have mastery in your chart with the 11 in the Karma position and the 9 in your path. You may not always connect with your ability to be the master in the physical realm. However, use the breath and your ability to shine brightly (7 in the gift position) to see yourself as the master and move through any doubts. You can master anything, especially, the issues you are facing now. With the 9 (subtle body) in your path, you are fully fulfilled when you are calm, graceful, and subtle. You are also able to show others how to embody these qualities. Drawn on that inner calm to help you at this time. Yes, please get one of the great books here in Spirit Voyage to help you dig deeper on to sets and meditations to help you! Having the 8 in the Destiny position means that you have a talent for using the breath to combat fear and blocks that has been with you for many lifetimes. I highly recommend doing pranayama on a daily basis to help you move through these fears. That, in combination with the 7 in the Gift position representing your connection to spirit and the ability to use the power of prayer will help you move through any feelings of being paralyzed. Maybe you can both try out a mediation together and support each other in a 40 day practice that will strengthen one of your talents or balance one of your weaknesses that you share. For instance, you have a 1 in the Gift position and he has a 1 in the Destiny position. Maybe you can do a meditation that strengthens the 1st Chakra and Soul Body. apply a little pressure at your sternum area with your folded hands by pressing them in to your chest. – Sit up with a straight spine, close your eyes and focus them at the third eye point and start doing some long deep breathing in through the nose and out through the nose. As you inhale, feel the belly expand with air and as you exhale, feel the belly collapse back towards the spine. – Next you will chant the mantra ong namo guru dev namo 3 x. – Then, hold your hands like you are going to clap them at your navel point keeping about 5 inches between them. Inhale 5 parts through the nose and exhale 5 parts through the mouth. Each time you take a breath in or exhale a breath out, you draw your hands back and bring them forward like you are going to clap them but stopping where there is that 5 inches between them. This should be a fast sharp movement done with intention. – You want to do this for a full 16 mins if you can. To start you can try 11 but I think you will be able to do the 16. I say mantra to myself on each breath to help me keep my focus and from my mind wondering. So its like this.. There are 5 breaths in and out right? So 5 syllables.. 1. Sat 2. Nam 3. Wah 4. Hey 5. Guru.. say these in your mind as your inhale each part and exhale each part. I’ve also attached a sound clip for that so you know what it sounds like. Waheguru = Wow! God is amazing or the divine is amazing! With this mantra you are celebrating the awesome power of the divine in yourself and in everything. This breath work will help you open your heart and conquer fear. If you can do it every day for 40 days you will be feeling awesome! And then if you want you can do it as long as you want. It will also keep you young and extend your life. To end breath of 10 you want to inhale and press your hands up to your face and hold for a few seconds, exhale, inhale deep and press your hands to your heart center and hold, exhale, then inhale one more time and press your hands to your navel point. Each time you do this feeling the energy in your hands and in the area you are touching. Imagine healing and balance going in to those areas through your hands. Then bring your hands back in to prayer mudra and chant 3 long “Sat Nams”. You have all the tools you need to conquer your fear and doubt. Be strong, be the amazing being that you are and shine, shine, shine through all the funky stuff. The breath work will burn that all away. I lost my husband six months ago in a tragic accident and having a difficult time. Do these numbers indicate this difficulty … and … can I use these numbers in some way to heal? Sat Nam and thank you for this article. I checked my numbers and compared them to my husband’s. Interestingly, we share the same numbers but one, only they’re not in the same positions. Karma: He 1, I 3, Soul: He 2, I 4, Gift: He 9, I 10, Destiny: He 10, I 2, Path: He 4, I 9. Using this article and the numerology calculator on the 3HO site, I discovered that my Soul and Path = 11; Karma = 10; Gift = 7; and Destiny = 8. Looking at your chart and the 3HO calculator, it seems that my strengths are all the things that scare me most, paralyse me for fear of not being able to achieve them. I am working towards acceptance on a conscious level, and am very frustrated by the constant sense of overwhelm and fear that I know is holding me in its clutches. That these are the things that frighten me so tells me that they are the sources of my greatest power, and that embracing them would change my life. Now I have to find the best tools to do that. Dear Jiwan Shakti Kaur, I´ve got your answer on my e-mail, thank you very much!! it got me full of hope and got me calm and draw a smile on me. This book is a great place to start Patwant Kaur! HI, I´ve read about numerology on the web site, and I got very hopefull about it, hopefull that it can help me on the difficult moment that i´m going trough, my marriage break up, and I ask for help about recomendations based on my numbers about kriyas, mantras, focus of certains chakras, or anything you can help me with. My birth date is 11/17/1979, means karma: 11, soul: 8, gift: 7, destiny: 8 and path: 9. I’ve just begun my journey into the realm of Kundalini Yoga. I’m in a teacher training course now (not specifically for Kundalini, the course encompasses many styles) and I am going through so many soulful revelations right now that having some guidance about my path would be of tremendous benefit to me and my family. My birthday is 9/29/81. If I’ve done my math right that makes me Karma #9, my Soul #11, my Gift #9, my Destiny #10 and my Path #3. Any guidance or meditations you suggest would be a guiding light! Sat nam Lauren! If you are interested in knowing about your own numerology more fully, I’d recommend that you invest in one of the numerology books. Ten Light Bodies of Consciousness is the one I use for myself, and i’m always finding myself checking it out and going into depth with the meditation and kriya suggested for the bodies. Make sure you strengthen your positive mind, since your path is a three. Blessings! Sat Nam Dear Jiwan Shakti Kaur! I´m a chilean kundalini yoga student. I was cheking the page and got amazed with numerology!!!! I would really aprecciate if you can help me with my numbers. I´m going trough a hard time now, me and my husband broked up about 5 months ago, and it´s been hard, we have had been together for 7 years, my heart is really in pain, and I really could use some advice and guides from the numbers. I feel very hopeless and sad somedays, and I can´t just let it go and get confidence about that the universe will be take care about the situation. I ask you so bad for advice on kriyas, meditations and mantras, aswell about on which chakras should i put more focus on, and everything you can tell me to get more strenght, to search for the love inside and healing myself. Sat Nam Jiwan Shakti Kaur! That was all INCREDIBLY helpful! Thank you for taking the time out to do that. It was “so on the money!” I’ve always had a sense of some “weakness” in my lower chakras, so I will definitely focus on them more…Meditation has been my saving grace for keeping me grounded for the past few years. Be blessed! Take a look at the post above for Manjinder since you both have the same gift and destiny number! However, since your soul, path, and destiny numbers are the same, this gives you a definite advantage since the positive talents you have had through many lifetimes line up with your challenges in this lifetime. In other words, piece of cake! Right? 😉 Yes, but you definitely want to do the work to strengthen the 7th chakra and Aura so the positive attributes can outshine the negative ones in this lifetime. Your intuition is right on! Since 7 is your soul number and path it relates to your relationship to yourself and your life purpose. Important stuff eh?! So let’s be able to recognize the positive and negative aspects of this 7 in those spots so you can use the positive ones to overcome the negative ones. You are really confident in who you are and have a general sense of certainty that you are on the right path. You inspire others to dive deeper in to their own awareness and connection to the universal energy and flow. It gives you great joy to share your experiences in order to uplift and encourage others. Unconditional love, bliss, and oneness come very easy to you. You have a lot of joy, apathy, bliss, and peace! Not bad. 🙂 You have the ability to manifest very powerfully from your thoughts and drawn on the power of spirit and the infinite to support that. You can brighten up a whole room just by walking through the door. You may feel highly sensitive to other people’s “stuff” and unsure of how to shield yourself properly. Your immune system might tend to be weak so you frequently pick up colds or bugs that are floating around. You may experience an overall feeling of defeat and gravitate towards introversion, often dwelling things you view to be past failures. Your mind may be more closed and you will experience a lack of seeing the big picture. You may start to doubt spiritual truths, or to the other extent become very extreme and fanatical in your spirituality. Since this number is in the soul position and relates to how you see yourself, you may start to experience yourself as sickly, always worrying about picking up illnesses. You may question your ability uplift and inspire others through sharing your personal story. You may shy away from the responsibility that comes with being grounded in your spirituality and expressing yourself freely. Having that 2 in your Karma position, means that you can use the positive attributes of your 7 to counteract the challenges that come along with how others view you through the aspects of that 2. You will still want to focus on strengthening and balancing your negative mind and 2nd chakra so any set and meditation that facilitates that would be great for you as well. Use your ability to elevate, uplift and experience joy and bliss when feeling issues with creativity or expressing yourself, which can be negative aspects of the 2. You are grounded, secure and connected to the earth. You take solace in your connection to the God consciousness within and draw on that to eliminate fear and insecurity. You lead with your heart instead of your head and are able to express yourself creatively and safely with others. Others will see this is in you and are drawn to your grounded and fearless nature. 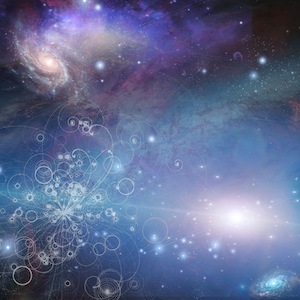 They are able to see the reflection of their own infinity in you and the connection to the creative flow of the universe that you both share. You are in your head a lot may find yourself over-analyzing things regularly. There may be a constant conflict between your head and heart confusing your decision making. You may feel very scattered ans unsure of many basic things in your life such as home, health, relationships, etc. You have a hard time feeling vulnerable and may come across as distrustful of others and the world in general. These blocks can also manifest physically as lower back pain, constipation, or sciatica. Again, because this number is in your Karma position, others will relate to these negative aspects when you are not in balance. They may pick up on your ungrounded vibe or scattered behavior when they are around you. They may have trouble connecting with you because they sense your distrust and lack of self worth. This is the power of intuition and prayer. You have a natural ability to know things in your gut and see with out physical sight. You may experience psychic abilities such as clairvoyance. Trust it! Through trusting your intuition and using the power of your own spirituality, you are able to combat any fears and insecurities that may arise from the 1 in your Karma position. These talents will help you to trust in your heart and creativity when any confusion arises. You are able to use your inner knowing to always be connected to the divine consciousness within you in turn combating any doubts. This is platform for elevation. Having this as your destiny number means you have the ability to brighten up a room when you walk in to it. You are naturally a light and easily bring light to others. It is easy for you to experience bliss and see everything as One. You are able to easily access the knowledge and understanding of the divine. These talents will help you to combat the negative aspects of your Karma number since when strong, you are a bright shining light and that is how others will primarily relate to you. You will be strong in your spiritual reality and others will gravitate to that and want to be around it. Notice that the 6th and 7th chakras are at the opposite end of the spectrum than the 1st chakra. This means you are more developed in your upper chakras and can use some support in your lower chakras (1, 3). The key here is balance and for you meditate, meditate, meditate, shine bright, and connect to spirit as much as possible. These things will support you when dealing with challenges of 1 and 3. So to sum it up, you want to strengthen your 1st and 3rd chakras and connect more deeply with your Gift and Destiny (6,7) so you can use those talents to help you. I highly recommend getting the book “The Kundalni Yoga Experience by Guru Dharam S. Khalsa since it has many sets and meditations that work on the 10 bodies and 7 chakras. Thank you so much for this very interesting quick view! 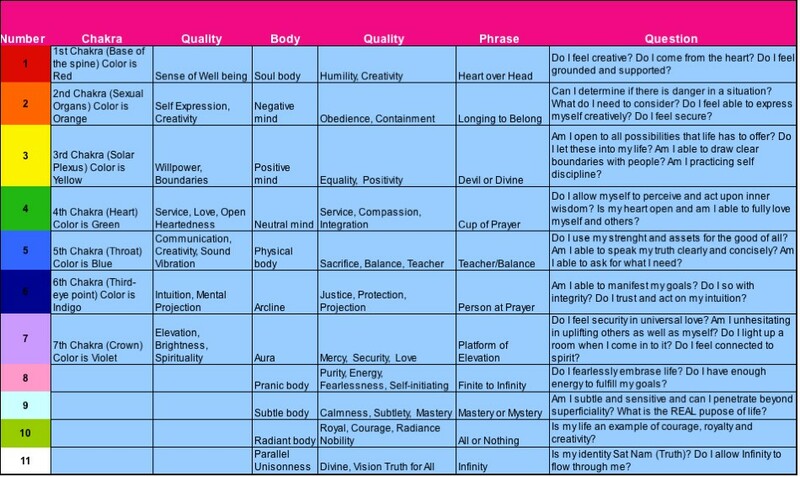 I got 7 in Soul, Path and Destiny – (2 in Karma 6 in Gift) Should I focus on Kriyas / meditations for the 7th Chakra and the Aura to “support” them? My spiritual name is Manjinder Kaur. Thank you for this post. We have the same birth year and path number – yay! I’m sending you an email right NOW!